Bradford Equity Partnership - Supporting lesbian, gay, bisexual & trans (LGBT) communities. 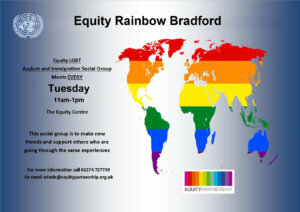 Equity Partnership is a charity set up and delivered by LGBT people in Bradford and the surrounding areas. Equity Partnership delivers training to a wide range of organisations to give them the knowledge and tools to combat homophobia and transphobia and to help them create LGBT friendly workplaces and services. We support LGBT groups and individuals to have a say in the decisions taken by agencies, which affect our lives, and work in partnership with other voluntary and statutory agencies, such as Bradford Council and Bradford Hate Crime Alliance. 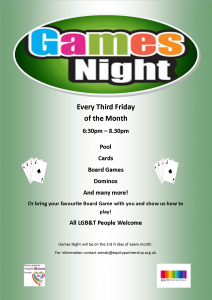 Our community centre provides a safe and relaxed space for all LGBT people to socialise and learn. It is also available for hire, being a fully-equipped training resource and a venue for events right in the centre of Bradford. Equity Partnership undertakes research to identify the needs and opinions of local LGBT people. This research is used to influence and educate agencies so that they are able to be more inclusive. 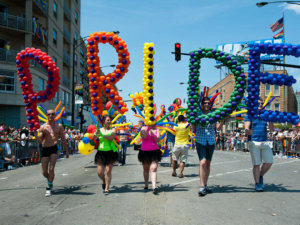 LGBT people are part of Bradford’s proud heritage and we like to let people know that we are here! We support and celebrate key LGBT events in the annual calendar. We also like to make sure that we are there when other celebrations and commemorations take place. Find out more on our events calendar.